Originally published in 1978, this classic exploration of humanity’s complex relationship with and understanding of wolves returns with a new afterword by the author. Humankind's relationship with the wolf is the sum of a spectrum of responses ranging from fear to admiration and affection. Lopez’s classic, careful study has won praise from a wide range of reviewers and improved the way books on wild animals are written. Of Wolves and Men explores the uneasy interaction between wolves and civilization over the centuries, and the wolf's prominence in our thoughts about wild creatures. 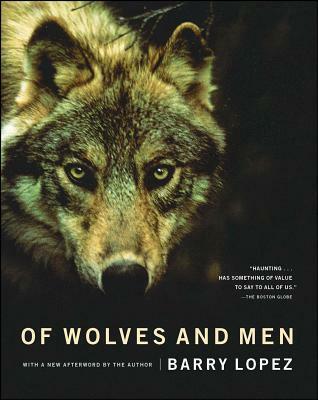 Drawing upon an impressive array of literature, history, science, and mythology as well as extensive personal experience with captive and free-ranging wolves, Lopez argues for the wolf's preservation and immerses the reader in its sensory world, creating a compelling portrait of the wolf both as a real animal and as imagined by different kinds of men. A scientist might perceive the wolf as defined by research data, while an Eskimo hunter sees a family provider much like himself. For many Native Americans the wolf is also a spiritual symbol, a respected animal that can strengthen the individual and the community. With irresistible charm and elegance, Of Wolves and Men celebrates careful scientific fieldwork, dispels folklore that has enabled the Western mind to demonize wolves, explains myths, and honors indigenous traditions, allowing us to understand how this remarkable animal has become so prominent for so long in the human heart. Barry Lopez's books include Light Action in the Caribbean (stories), About This Life (essays and memoir), the novella-length fable Crow and Weasel, and Arctic Dreams (nonfiction), for which he received the National Book Award. He has traveled extensively in remote regions of the world, and his work has been widely translated and anthologized. He is a recipient of fellowships from the Guggenheim, Lannan, and National Science foundations; the Award in Literature from the American Academy of Arts and Letters; the John Burroughs and John Hay medals; and other honors. He lives in rural western Oregon. John Fowles A remarkable book, both biologically absorbing and humanly rich, and one that should be read by every ecologically concerned American. George Schaller Animal Kingdom Of Wolves and Men is not only the best popular account of an animal I have read in a long time, but also something new -- a bridge between books of the past and those of the future, which, it is hoped, will incorporate and expand the perceptions so eloquently treated here. Edmund Fuller Wall Street Journal A splendid, beautiful book. Bayard Webster New Fork Times Book Review Fascinating....His book has a wealth of observation, mythology and mysticism about wolves that adds a colorful part to the still unfinished mosaic that defines the wolf. Walter Clemons Newsweek Eloquent....His own patient effort to understand a despised, feared and heavily mythologized beast induces a shiver, of strangeness, the sign of fresh, original work. Robert Kirsch Los Angeles Times Unusually informative and sensitive. Boston Globe Haunting....has something of value to say to all of us. Whitley Streiber Washington Post Brilliant...a work of intelligence, dedication and beauty, deserving the widest possible attention not only for the sake of wolves but also for the sake of men.